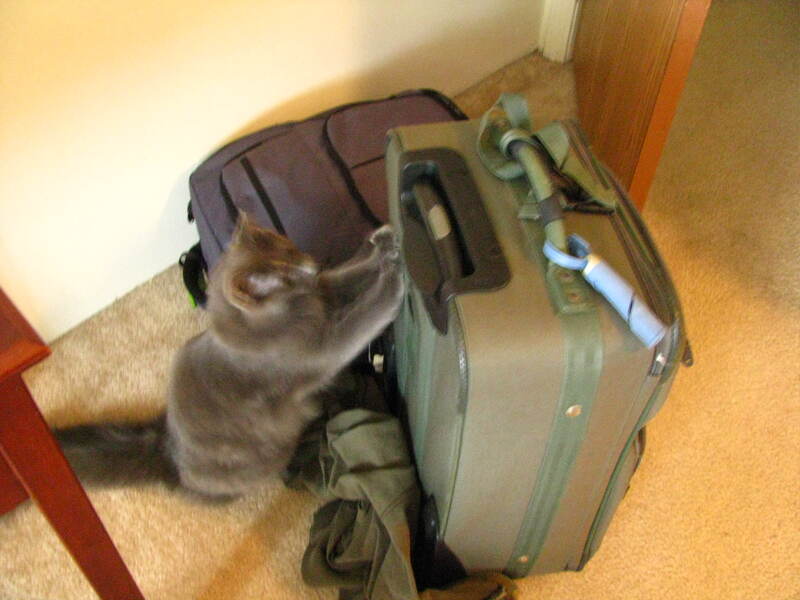 As I listen to my cat scratch my still-unpacked suitcase, I want to share a few general impressions from 4C’s and a little more on one session in particular. 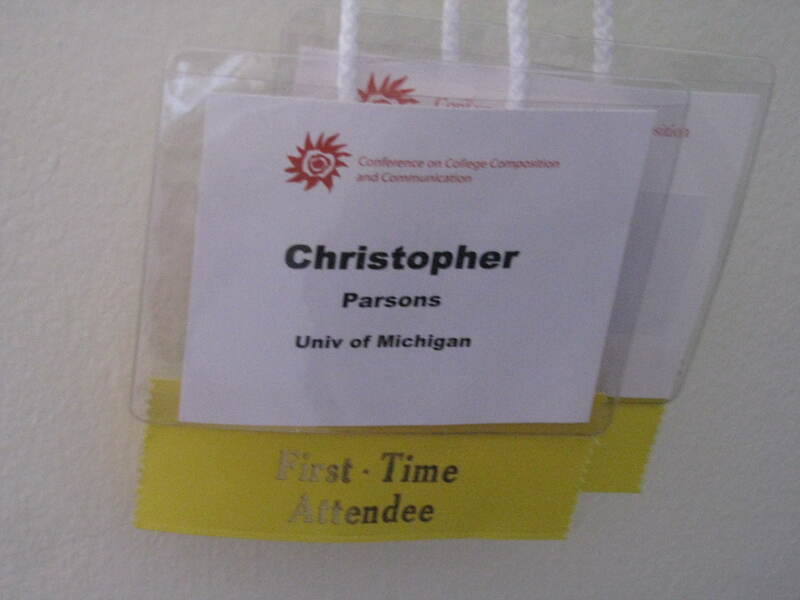 1) The sheer number of sessions that took digital pedagogy in the college writing classroom as a topic was surprising. Crystal made a good point, I think, that the attitude around these was more skeptical than celebratory / certain. But I was still surprised. 2) One thing that was underconsidered in the sessions I went to was concepts around design like universal and participatory. For example, I heard Peter Elbow talk about trusting the mouth, ear, and body for using vernaculars in classrooms but no complication / consideration about who this ideal body came from. AND. Jessica Enoch was a respondent on a panel about spatial rhetoric. Without going into too much detail, it seemed like considering participatory design could have at least helped with the language on unequal rhetorical spaces (a firehouse and a submarine) that 2 of the presenters considered. 3) Okay. I went to a session called: 14 Original Heuristics for Solving Writing Problems: A Roundtable in Tweets. The names! Selber, Selfe, Porter, Spinuzzi (among others I have at least heard of). I mostly just wanted to see what they all looked / sounded like. The idea was that with 1 slide (using only the Twitter allowed number of characters) and about 4 minutes each they could present all 14 sections in an edited collection about new media and technical writing. I’m going to try and explain the three reasons it didn’t quite work for me: a) the topic; b) the speed; c) the genre. To the quick on topic A, I know so little about technical writing that a lot of what was said was meaningless (outside of some computers and writing familiar conversations). That is not their fault and neither is (B) the speed with which they did it. 4 minutes is not exactly enough time to get situated in a field. Just to gripe a bit, however, I will say that in order to hit their 4 minutes, there was quite a bit of nose to the paper reading. And the Twitter-inspired slide often seemed to have a doubtful (or at least unexplained) relationship to that reading. I kept wondering as I tried to choose from 30 + sessions per time slot if some sort of notification system might be helpful for potential audience members. For example, a rating system on what level of topic familiarity is probably necessary for a given session? Is this experts talking to experts? Or will background / orienting information be given? Lastly, C: Twitter, a conference presentation, an edited collection of technical writing. These are three distinct genres not only in form / organization but also in the kinds of information that might be best presented / accessed within them. Trying to mix the three together makes me think about the care that needs to be taken when using media like Twitter to grapple with new / complex ideas. It’s not that I think Twitter can’t do it, but that pithy, speedy ethos, I would argue, needs a reconsideration of exactly what you can do in terms of the information presented. Stuart Selber told the audience that the beginning that this might turn into a mess. He was right, but that doesn’t mean it wasn’t an interesting mess.